Produced by GLOBE VIDEO FILMS and released March 2004. 'WESTERN HEROES' is the second diesel-hydraulic title from Globe Videos and the follow-up to 'WESTERN RENAISSANCE'. ** WARSHIP diesels in Cornwall, around Bristol and even Clapham Jn, including a double-headed maroon pairing on the Cornish Riviera Express at Teignmouth in 1969 and an unbelievable TRIPLE header on the 'Rivo' at Hayle in 1968. ** Film of the only WESTERN to visit the Hayle Wharf branch. ** D800 on a Penzance-Manchester express. 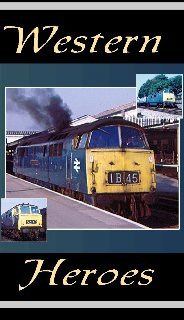 ** D6300s in service in Cornwall and around Bristol. ** HYMEK & steam pairings. ** D0280 Falcon storming past at high speed. ** WESTERN LORD in chromatic blue. ** Visit to Swindon Works in 1968. ** HYMEKS in their last days at Reading. ** As well as this the programme features over 50 of the Class of WESTERNS ! Commentary has been kept to a minimum so that the locos can do the talking! The extended production time on this programme is due to exhaustive and painstaking research of train and loco identities to ensure that captions are as informative as possible. To this extent some interesting anomalies have been resolved, even after so many years. Grateful thanks go here to Adrian Curtis, Martin Street, Steve Harrod, Steve Crowther and many others.